How do I set the bootloader so that in my dualboot with Windows 7/Ubuntu 11.04, Windows start up as standard instead of Ubuntu? Boot which ever operating system you booted last time, the "saved method"
This is the one I use. It lets me decide which one I going to use and will allow me to reboot into that system, handy when I'm updating. 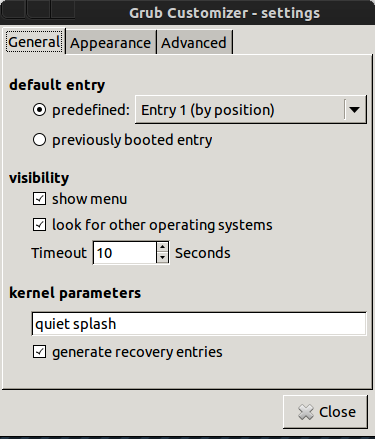 Boot a specific operating system by default. The answer to your exact question. You can see that the "saved" method can come in handy when booting multiple operating systems. Save the name of the entry you want e.g. Windows NT/2000/XP (loader) (on /dev/sda1), we need it later. and your password if asked. The nano editor will open. A. Saved method - In my preferred way, I made the following changes from the standard grub file. Change the value of GRUB_DEFAULT to the name of the Windows system you want to always boot. The name of the corresponding Grub menuentry can be found as described in the previous section. GRUB_DEFAULT="Windows NT/2000/XP (loader) (on /dev/sda1)"
Note: Some versions of Ubuntu require single quote (') vice double quote ("). You could also set GRUB_DEFAULT to the line number in the menu entry list (with 0 being the first), but when the kernel in Ubuntu is updated grub adds the new kernel to the top of the list, you would have to change the number, since Windows is the last one in the menu entry list. You can see this in my menu entry list. to update the system generated grub.cfg file in the /boot/grub/ directory. nano is especally easy to use in the terminal. Move around with the arrow keys. Type in you addtions, delete the unwanted. The -B or --backup option backs up the previous version of it to the current filename suffixed with a ~. Very handy in case of the dreaded Fat pfinger effect. When you are through, Ctrl+o will allow you to save your edits by hitting Enter and Ctrl+x will close. These and other options are shown at the bottom of the terminal screen with the ^ indicating Ctrl. Some in the Ubuntu community suggest sudoedit instead of nano. I recommend nano — which is the default sudoedit editor in later distributions of Ubuntu — instead of sudoedit, because the default can be overridden in non-obvious ways, unless you are an administrator. sudoedit is safer in that it automatically saves a backup copy of the edited file, but the -B command line option in nano does the same thing. nano is more intuitive than editors like vi or emacs, which are very flexible but require learning a lot of commands, shortcuts or different modes. If you prefer not to use the nano editor and prefer the Gnome Text Editor, instead of sudo nano -B use gksu gedit. I generally do this for large files, and /etc/default/grub could easily be considered a large file. Thus type in gksu gedit /etc/default/grub instead of sudo nano -B /etc/default/grub. Note that the Gnome text editor does not automatically make a backup! I made some changes to grub for my personal needs. Such as the background picture of the moon launch. How to do these are discussed at the Ubuntu Community Documentation page on Grub2, recommended. With a bit of command line trickery, you can get the default of grub to always be a particular grub entry - for example Windows - no matter when a new kernel is installed. You need to edit the /etc/default/grub file to set Windows as your default OS. You will then select the Windows partition, in my case "Windows 7 (loader) (on /dev/sda1)" including the double quotes and copy it. It will open the /etc/default/grub file with gedit. Look for the GRUB_DEFAULT=0 line and change it's value from 0 to the selected Windows menu entry by pasting it. .
Then launch it from dash , application lens. the above menu will be different to yours, so choose wisely and select the Windows 7 entry and from the top Menu bar , select the ^ arrow to move it upward to have the top position , while booting. For booting into Windows directly select the preference and reduce the boot-time to load windows. 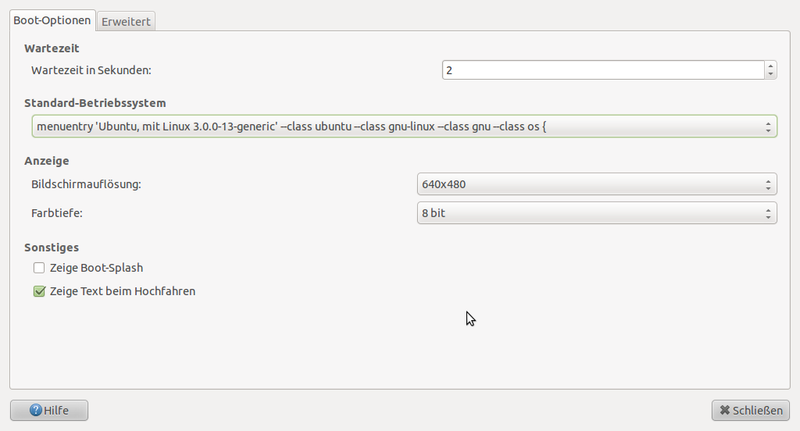 It can be done easily with a GUI tool called "Grub Customizer". Once installed, Hit Super key (Windows key) to open Unity dash and search for "" and open it. 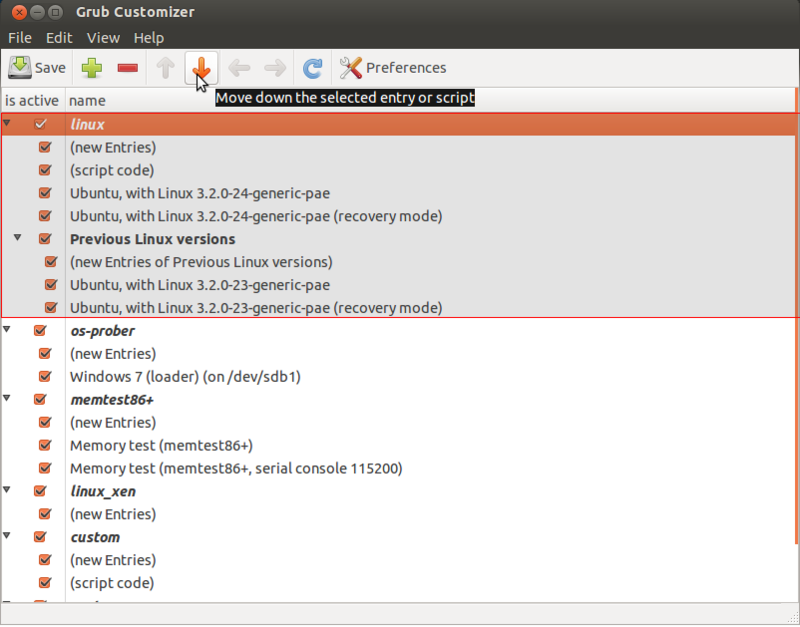 Select the Linux group by clicking on Linux and move it down by clicking on down arrow in toolbar. Once done, Click on save. That's it! Remember that you can't move single entries out of their respective group like Ubuntu can't be moved out of Linux group. Use startup manager, which you can start from the dash. There you can use the OS to start with in the dropdown menu. After that, run sudo update-grub. Look at the line we were talking about! In my machine, it is Windows 8 (loader) (en /dev/sda1). Write the name of your entry somewhere, and now let's set is as the default. GRUB_DEFAULT = "Windows 8 (loader) (en /dev/sda1)"
Now just save the file, close gedit, and update grub. Now just restart, and the Windows entry should be highlighted as the default! Is a very easy to use graphical GRUB2 settings manager. For now, it only allows you to edit the GRUB2 menu entries: reorder, rename or add/remove entries. It will also allow changes to background image and menu timeout. Since these are actually scripts which generate the boot.cfg file, Grub Customizer changes the actual script order and then generates a new boot.cfg so if you then run "sudo update-grub", your customization won't be overwritten. What that command does is search for Windows in /boot/grub/grub.cfg and remove the text outside of the " characters. The command will output something like Microsoft Windows XP Professional (on /dev/sdb2). GRUB_DEFAULT="Name of your Windows menu entry"
to regenerate the Grub menu. And that's it! Future upgrades won't mess this up. Your Windows menu entry will always be selected by default. save, quit, run the: update-grub command and reboot to behold your new changes! You don't need to install the grub-customizer!!! i do not know what ubuntu you have installed, so I am not sure that your OS is using grub2 or the old grub, but it is more likely that you have grub2. This command gives you an output saying what startup possibilities / OSes you have. As you may can observe, Windows 7 is on the 5th line of the output. To save the changes, type sudo update-grub. AND this is everything. where N is the position (starting from 0) of Windows7 entry in grub menu. Tell me if you need more info about this. I use grub customizer to do that. You can have it automatically boot into a certain OS every time or just boot into whichever OS was booted last. It is easy to install and use. Click OK and a couple of new lines will show up; close the Software Sources dialog now and push the check for updates button on your package manager if it didn't already start to update the available packages. 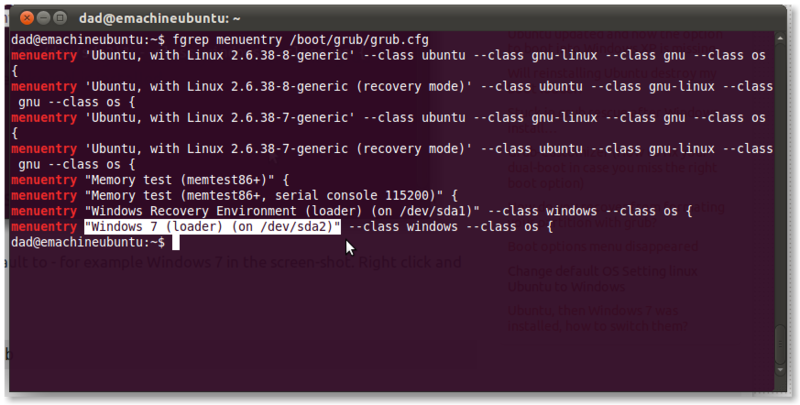 Type into the search function : "grub-cus" and you will see the grub customizer at the top of the list. Mark it for installation then click apply to start the process. Agree to install any dependencies so they get installed automatically as well. After installation, you can find grub-customizer by typing "grub" into the search dialog or you can also find it in the menu under Applications>Settings>Grub-Customizer. You may want to pick out a pretty picture to use as background to your grub boot menu. 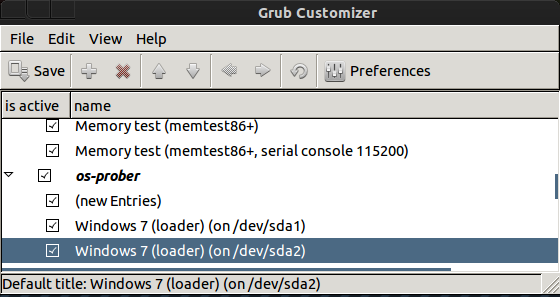 Then search in the Dash for grub customizer and change the predefined entry to Windows. How do I edit the boot order in the GRUB menu to have Windows first? How to make Windows the default OS in grub menu? How to make Windows boot first? How can I make Windows boot first and Ubuntu second? How to boot windows automatically? How do I change the the boot default from Ubuntu to Windows? How to set Windows the default OS on dual boot system? Trying to understand the boot loader process / GRUB?